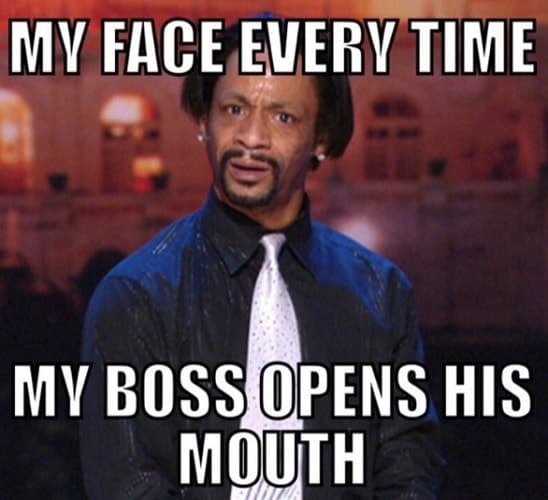 To brighten even the dullest day at work, all you need is a healthy dose of these funny boss memes! 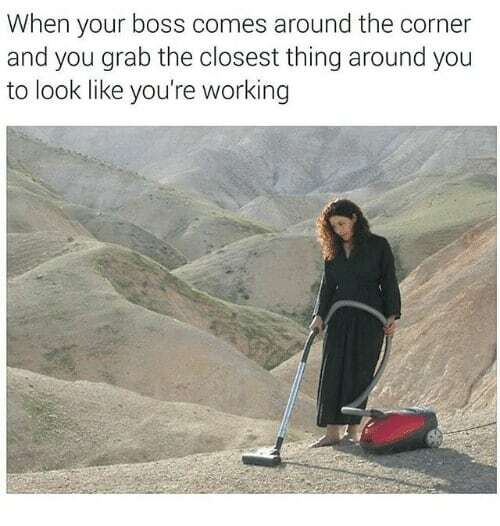 Guaranteed to bring a spark to the dreary and drab days in the office, we’ve collected the best of the memes to share with workmates. If you’re feeling daring enough, you can even share these with the big boss themselves! We take no responsibility for what happens next. On one hand, maybe you got lucky and have an awesome boss who’s super down to earth and cool. 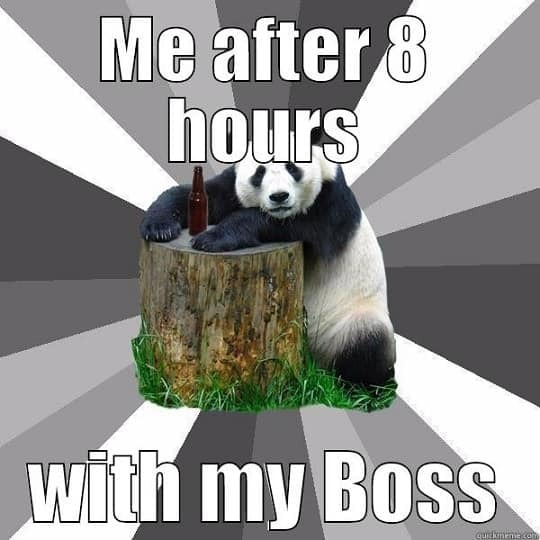 Some of the funny boss memes represent these hipster dudes who are totally chill and laid back. 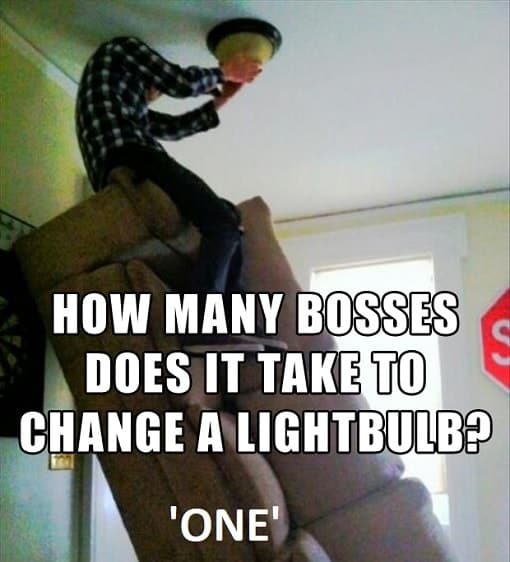 Most, however, focus on the more common types of bosses out there. 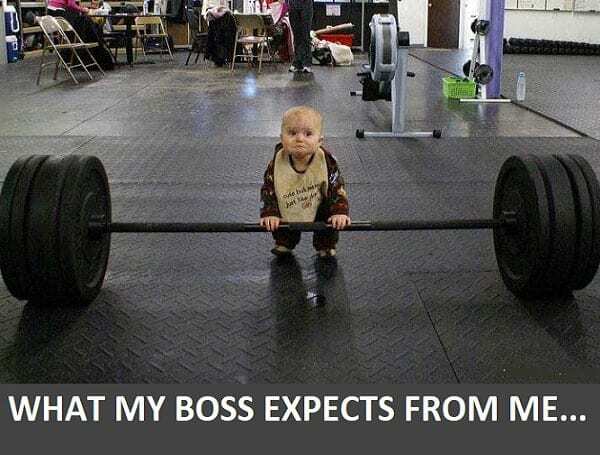 The ones who act like a total dictator, or a micro-manager, or one who’s simply too cool to look twice at you. 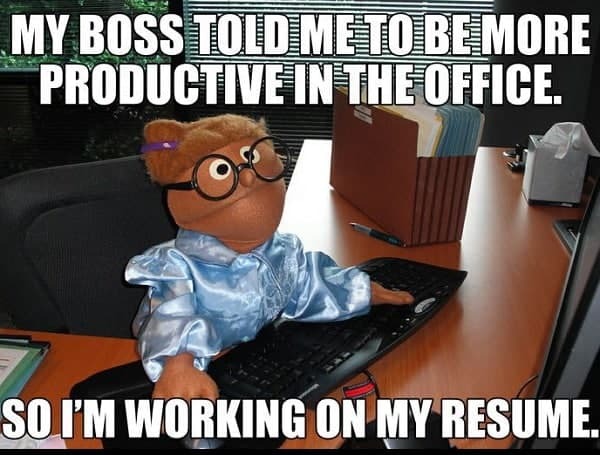 There are all kinds of situations that are commonly portrayed in these memes, from promotion times and paycheck chats to water cooler moments and KPIs and OKRs. Don’t know what these abbreviations mean? No problem! 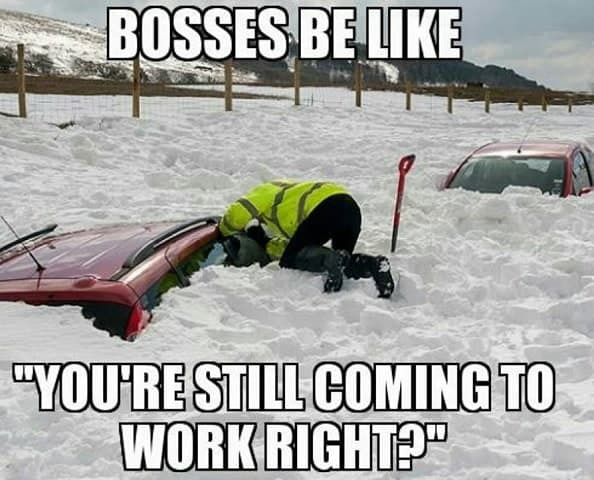 All you need to appreciate these memes is a good sense of humor, and a taste for workplace satire. 1. 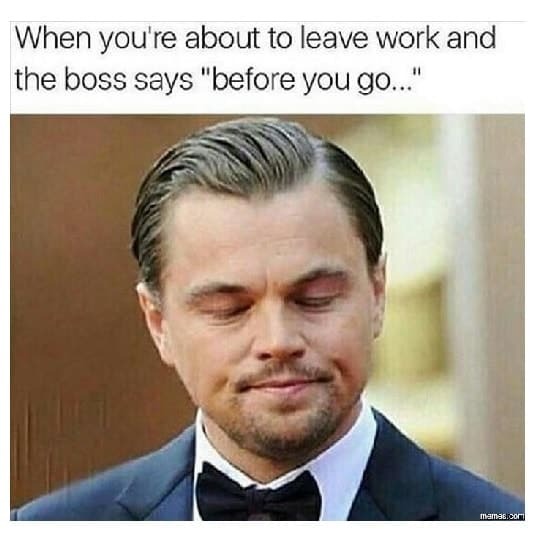 When Your Boss Asks You to Do Something After You’ve Already Left Work for The Day. 2. My Boss Told Me to Be More Productive in The Office. So I’m Working on My Resume. 4. 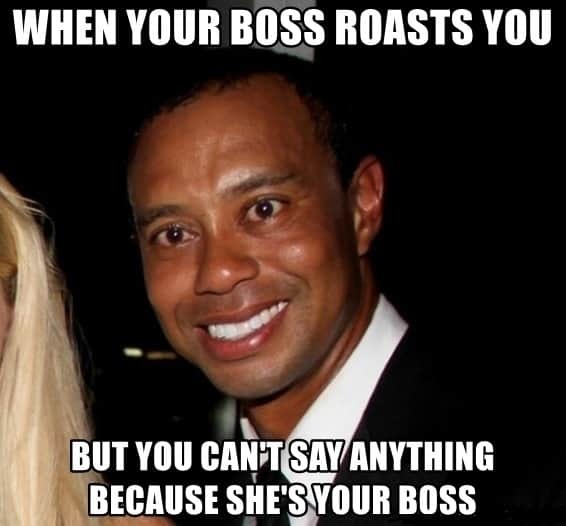 When Your Boss Roasts You But You Can’t Say Anything Because She’s Your Boss! 5. 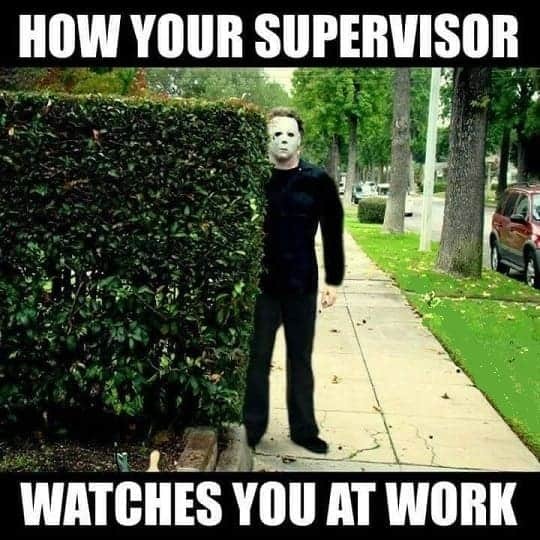 How Your Supervisor Watches You at Work. 6. 30 Minutes Late for Work. 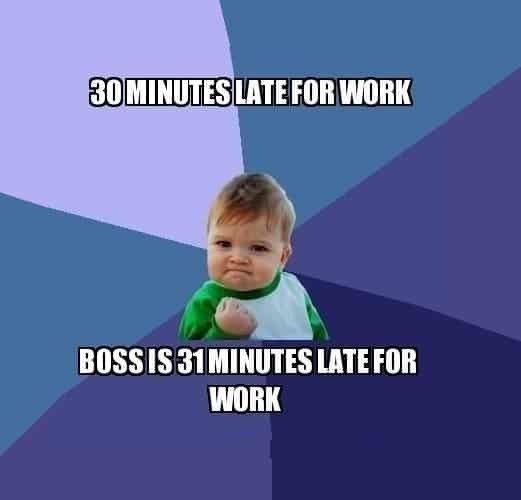 Boss Is 31 Minutes Late for Work. 7. 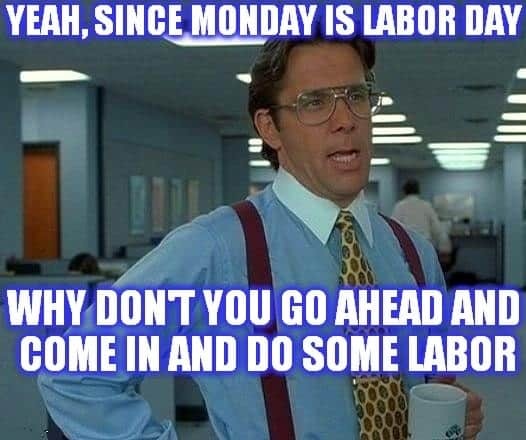 Yeah, Since Monday Is Labor Day Why Don’t You Go Ahead And Come In And Do Some Labor! 9. 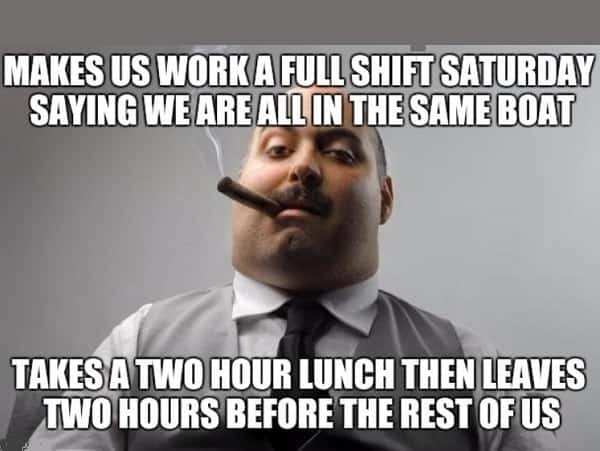 Makes Us Work A Full Shift Saturday Saying We Are All in The Same Boat, Takes A Two Hour Lunch Then Leaves Two Hours Before The Rest of Us. 12. Boss: You’ve Been Late 3 Days This Week, Do You Know What That Means? 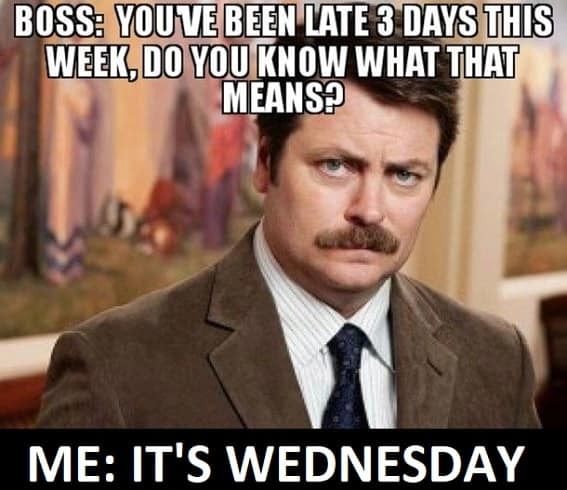 Me: It’s Wednesday. 13. 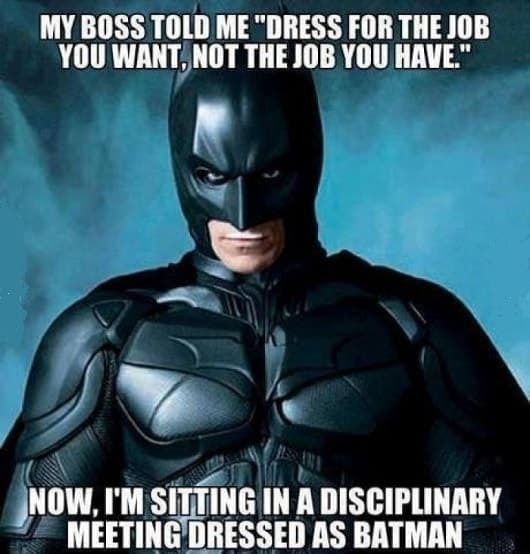 My Boss Told Me “Dress for The Job You Want, Not The Job You Have.” Now, I’m Sitting in A Disciplinary Meeting Dressed As Batman. 14. 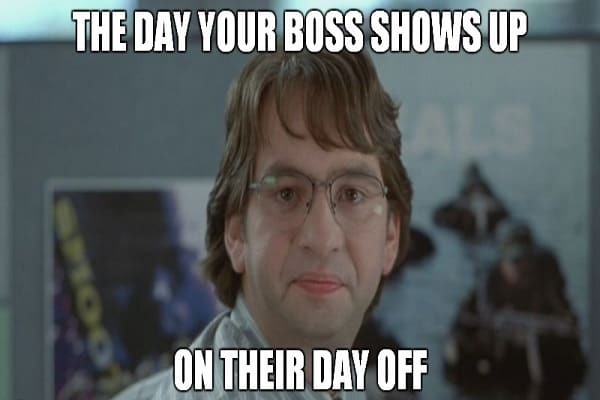 The Day Your Boss Shows Up On Their Day Off! 15. 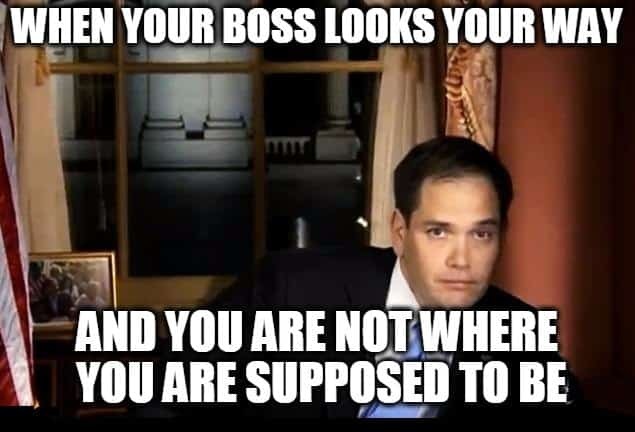 When Your Boss Looks Your Way And You Are Not Where You Are Supposed to Be. 16. 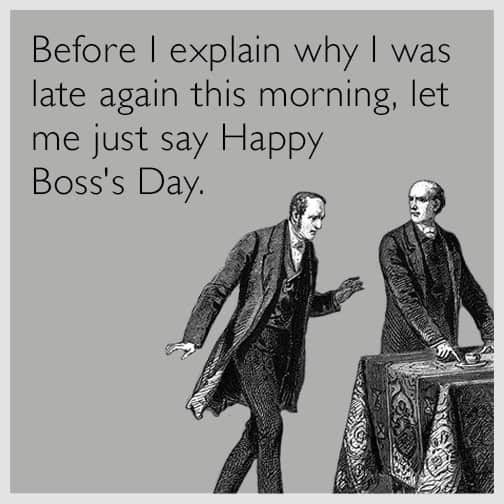 Before I Explain Why I Was Late Again This Morning, Let Me Just Say Happy Boss’s Day. 17. 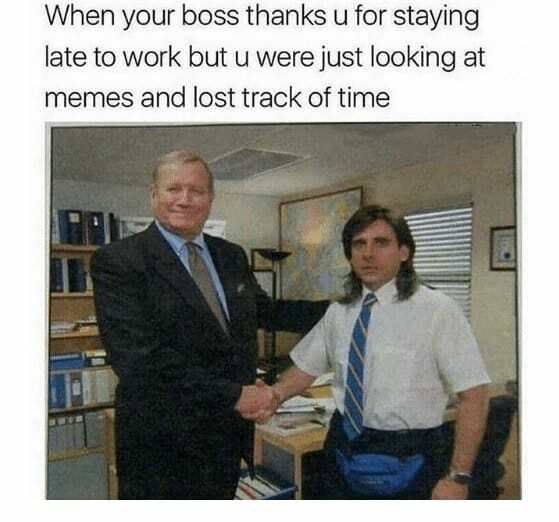 When Your Boss Thanks U for Staying Late to Work But U Were Just Looking at Memes And Lost Track of Time. 18. 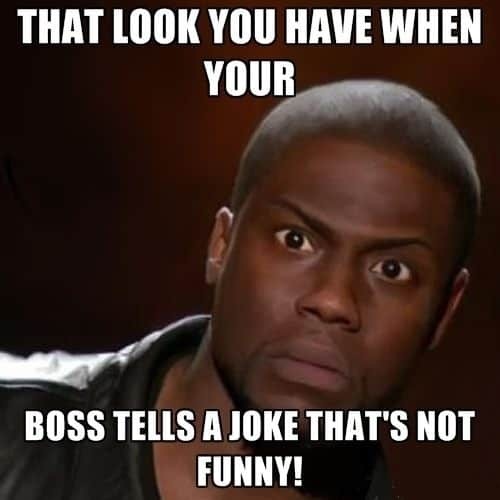 That Look you Have When Your Boss Tells A Joke That’s Not Funny! 19. 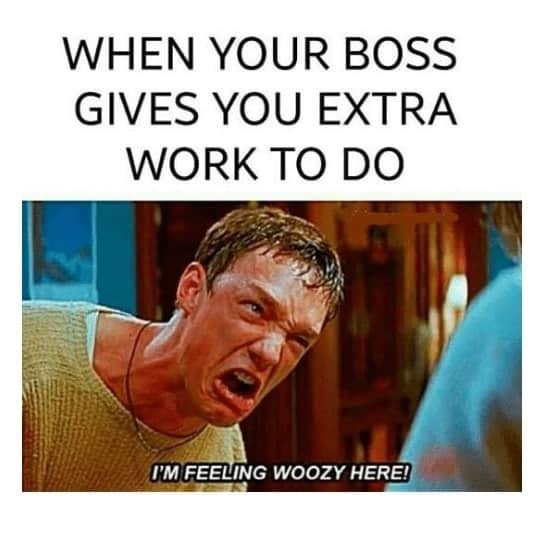 When Your Boss Gives You Extra Work to Do. I’m Feeling Woozy Here! 21. 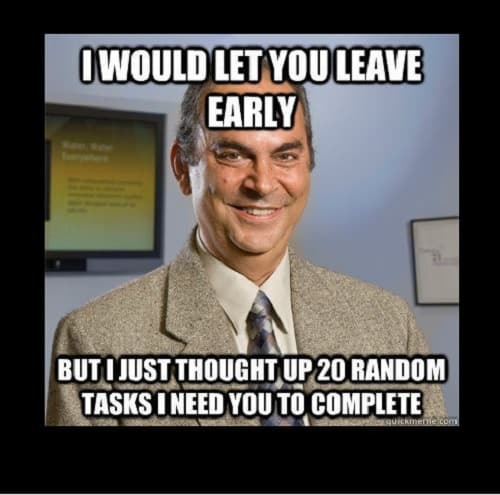 I Would Let You Leave Early But I Just Thought Up 20 Random Tasks I Need You to Complete. 22. 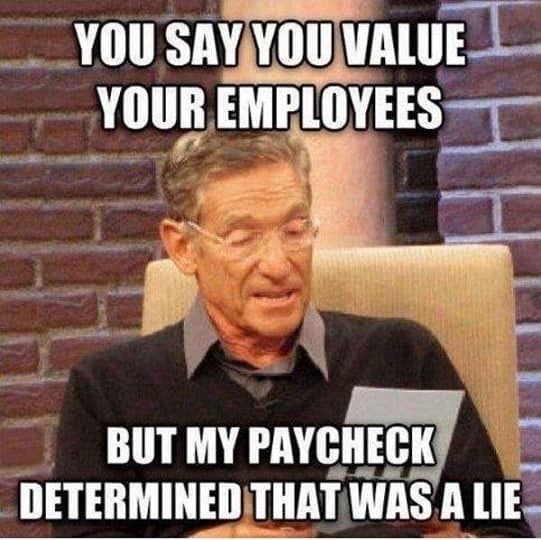 You Say You Value Your Employees But My Paycheck Determined That Was A Lie. 23. 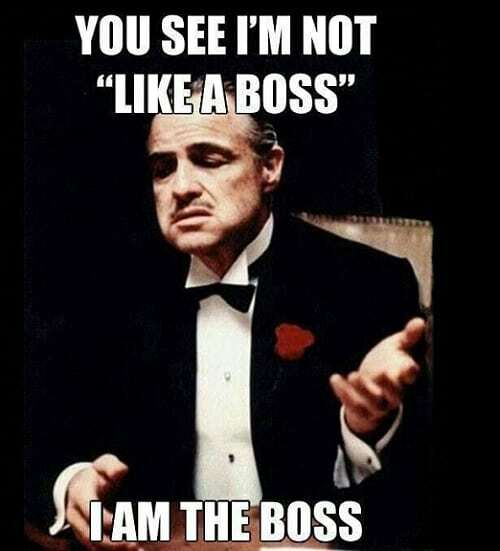 You See I’m Not “Like A Boss”, I Am The Boss. 24. 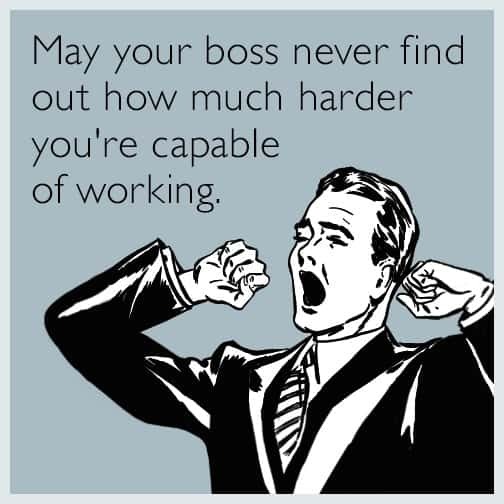 May Your Boss Never Find Out How Much Harder You’re Capable of Working. 25. 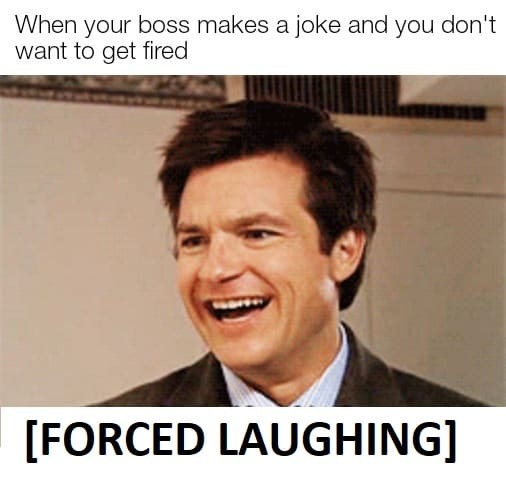 When Your Boss Makes A Joke And You Don’t Want to Get Fired. [Forced Laughing]. 26. 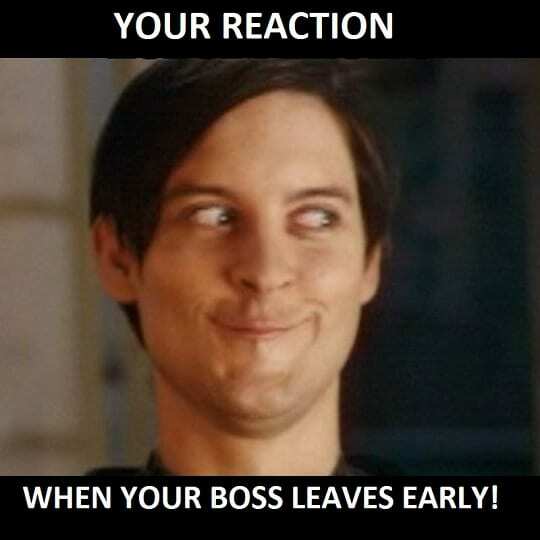 Your Reaction When Your Boss Leaves Early! 28. 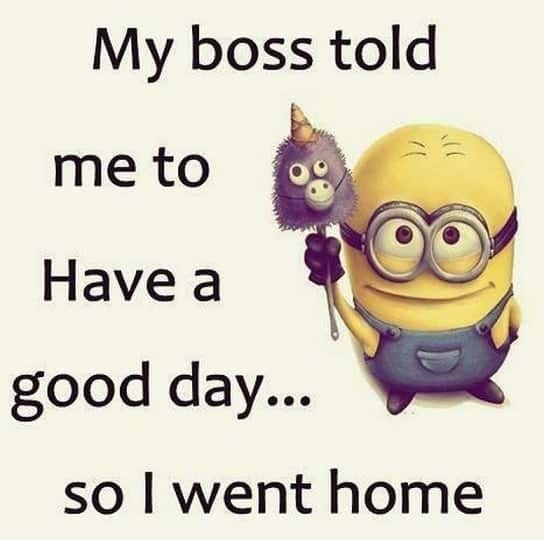 My Boss Told Me to Have A Good Day… So I Went Home. 29. When Your Boss Comes Around The Corner And You Grab The Closest Thing Around You to Look Like You’re Working. 30. 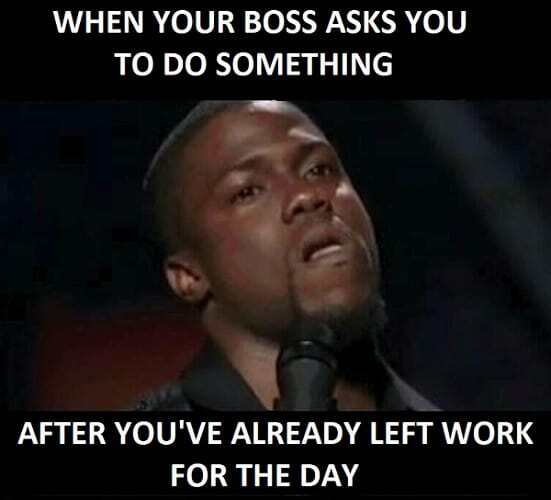 Me After 8 Hours With My Boss. 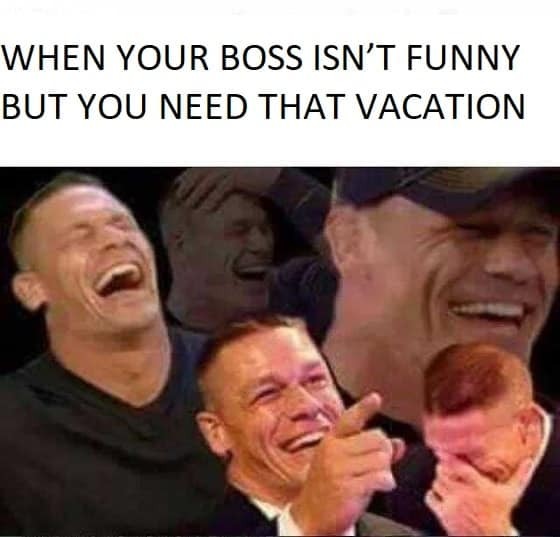 What did you think of these funny boss memes? Any of them remind you of a particular employer who’s hopefully not staring over your shoulder right now? Send a couple to do the rounds through the office, but keep them on the low-down!